This year on Diwali, again like the other festivals, I thought of focusing on some of the finer aspects of this festival in India rather than the usual fireworks display or the fireworks going off in the sky. I happened to visit this busy market place near my house on the eve of Diwali with my wife - we had some pending shopping to be completed and I noticed these beautiful collectibles, one would buy for Diwali (I actually wanted to click something that was symbolic of Diwali as a festival and something that anybody could easily relate with apart from fireworks and crackers). The whole place was lit up as one would expect during Diwali and it was abuzz with people - lots of people. There were colorful lights everywhere, nice & beautiful earthen candles (diyas), chocolates, sweets, flowers and idols of lord Ganesha and Lord Lakshmi - basically anything and everything that would brighten up your house and your mood. To me these pictures capture the essence of color along with lights, which so truly define Diwali as a festival.. Happy Viewing! As in the previous years I decided to cover Durga Puja in my photography journal this year as well. This is a time of the year, when there are two of the biggest Indian festivals lined up one after the other - Durga Puja in October and Diwali in November. People are in the best of their moods, wearing new clothes with vibrant, bright colors and a sense of celebration and joy can be felt all around in the air. Durga Puja is a very "bengali" festival. I say this because the mention of Durga Puja instantly brings a top of the mind recall for Kolkata and West Bengal - the Indian state of which the people are known as Bengalis. Durga Puja is celebrated as a symbol of home-coming for Goddess Durga, who it is believed descends on earth with her family and comes to her paternal home for a period of 5 days. The festival revolves around these 5 days as people in the house (all devotees) worship the goddess and arrange for public feasts and cultural programs to celebrate this home-coming. This year instead of focusing on the very obvious perspective of the festival (the prayers, the priests, the luncheon etc. ), I decided to picture some of the other activities that happen during this period of 5 days, which form an integral part of the festivities and can be qualified as a signature of all Durga Puja celebrations. 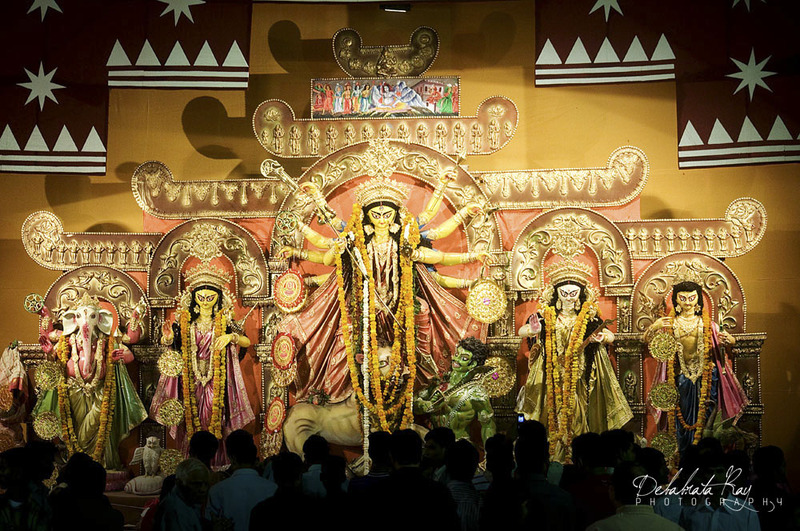 Durga Puja is usually celebrated in large well designed structures made of bamboo and cloth (also known as Pandals) - some of them in cities like Kolkata are made on a theme as replicas of world famous buildings or monuments and are worth a sight, however in other places celebrations also happen within community centers. Whichever be the place the entrance is beautifully done up with colorful alpona (beautiful paintings / drawings created using colored rice grains / rice dust) - marked as a welcome gesture for the goddess. Any durga puja celebration would be incomplete without the sound of the dhaak (drums that are slung on the shoulders while playing.). The dhaak is symbolic of any Durga puja celebrations and is a must-have instrument when prayers are offered to the goddess. During the 5 days, if you're near a puja pandal you can't miss the distinctive beat of the dhaak. The dhaakis or the drummers are the ones who make these drums come to life bringing out those captivating , mesmerizing beats which we all have come to relate with the Durga Puja. Its a worthwhile picture of the dhaakis who themselves seem to get transformed into a state of trance and start dancing in rhythmic tandem while playing the drums. It wouldn't be incorrect if someone were to tell you that the dhak is the soul of the Pujas. The way this instrument is played during prayers or aarti, it just makes the atmosphere electric. Various items are offered to the goddess during the Pujas; the key ones being sweets, fruits and sarees (cotton sarees are the norm - bengal is famous for its cotton sarees - also known as Taant Sarees). One interesting trivia about these offerings is that with these offerings devotees would typically give the names and gotras (ancestral origins I guess) to the priest, who in turn offers prayers for the well-being of everyone in the list! Flowers are an integral part of any festival celebrations in India. Ladies of the society are typically observed to take part in preparations for the Prayers, while the men would typically shoulder responsibilities for activities involving more of physical / coordination work - for e.g. serving community lunches or conducting cultural events. While prayers are held during the mornings, through the day till the early evenings, the nights are packed with cultural events. There is a great deal of effort put into these cultural events by members of the puja samiti (group of members who collectively perform these pujas). 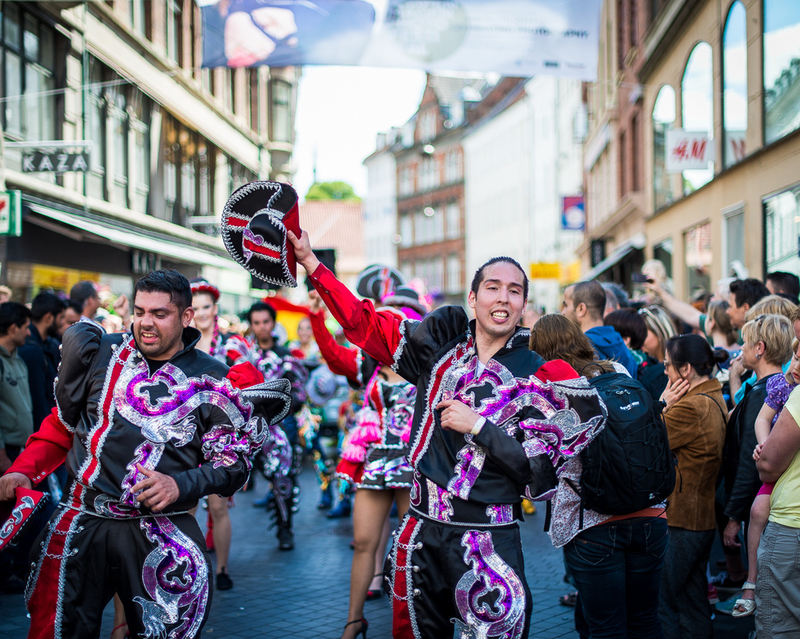 Rehearsals start months in advance and clothes are made to order or hired to ensure events are filled with as much color and vibrance as possible. It is not uncommon for celebrities to be called-upon from Kolkata to perform at pujas held outside of West Bengal. These 5 days of festivities brings together bengalis from all generations and its a common feeling for all bengalis to be able to experience cultural aspects of a rich tradition which is very close to their roots. At the end of an exciting and fun filled five days, its time to say good-bye now as the Goddess prepares to return to the heavens. Its a sight worth watching. This day is a buzz of activities by the ladies of the society, who prepare the "baarir mae" (daughter of the house in Bengali) to go back to her husband's home. The preparations are akin to getting the daughter of the house married. The goddess is offered sweets, paan (beetle leaves) and water besides being applied Sindur (vermilion) on her forehead. Vermilion in India is considered a symbol of a married woman (its sad that many modern women are moving away from this culture today). Although the daughter of the house is leaving to return to her heavenly abode, its time to rejoice the fact that she will return again the coming year. An important aspect to note about the sindur daan ceremony is that, this is performed only by the married ladies of the house and that the ladies when putting sindur on the godesses' forehead pray to her to keep their suhaag (matrimony) intact. Post the sindur daan ceremony, the ladies get into a jovial mood and apply sindur to one another and offer sweets (referred to as sindur khela). This gesture, apart from being an immense opportunity to bond with each other, is to also rejoice and reaffirm their belief that their family bonds will be strengthened further. While sindur khala is still on, there are more ways then one to celebrate this day as it marks the end of the 5 day spectacle and why not enjoy it to the hilt while it lasts. Ladies in the society join in the fun and start dancing as dhaakis play the dhaak in the background. It's an atmosphere of joy and celebrations, of unity in diversity, of wishing for well-being of everyone and of hope and belief. As the day nears its end and energy levels wind down, the idols are slowly lifted and taken away in trucks to be submerged in the river. Submerging the goddess in a water-body (River, Lake etc.) marks the end of this festival.